As the season turns to holiday time, and as in season's past we'll be posting a little holiday decor inspiration here and there for the upcoming season. 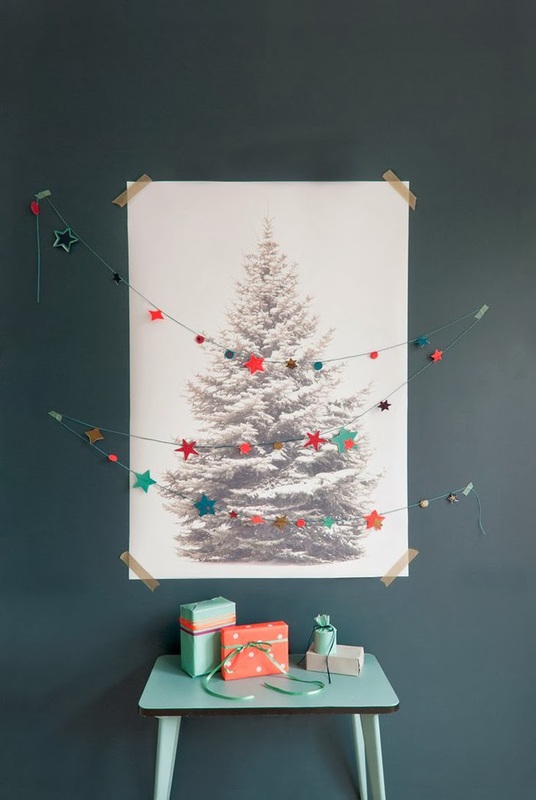 Today, I ran into this cute String of Stars display from BijzonderMOOI* out of the Netherlands and thought it was a cute version of the tree on the wall idea. The String of Stars also makes a great gift to post. Cute! Update for those asking: Vivian tells us she made the tree print herself at a copy shop (see comments) but I see you can find something similar at IKEA here. Let the Christmas fever begin! This is certainly getting me in the mood.... Beautiful. Where can I get this amazing tree poster from? I'm definitely looking to do some unique decorations this year - love this idea! Do you know where can I order the poster of the fir tree? It looks like the new Ikea fabric.